The Amazon founder, the world’s wealthiest person, offered only some general principles for the Bezos Day One Fund, which will begin with $2 billion. The structure of Bezos’ new philanthropic push is still coming into focus. 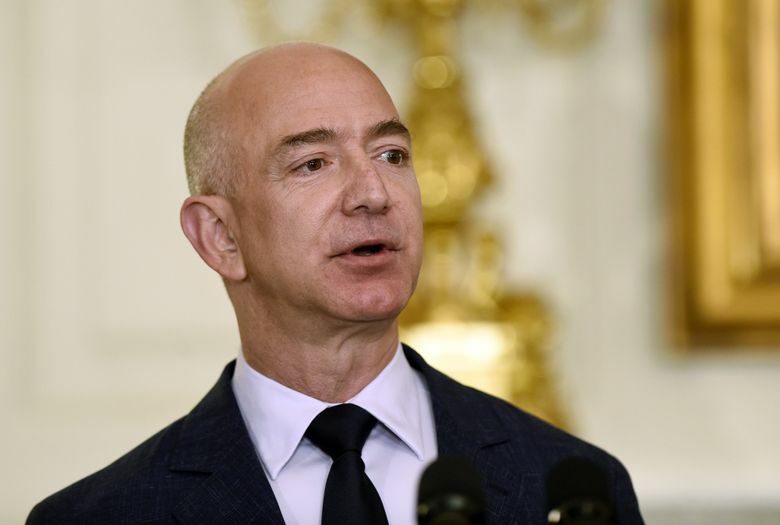 The name “Bezos Day 1 Foundation” was reserved Wednesday as a nonprofit corporation with the Washington Secretary of State’s office, suggesting it will be based here. Another entity, the Bezos Foundation, was registered with the state on Jan. 23 as a nonprofit corporation. These are in addition to the Bezos Family Foundation, headed by Jackie and Mike Bezos – Jeff Bezos’ parents – a nonprofit focused on education incorporated in 2000. Bezos is worth $164 billion, according to the Bloomberg Billionaires Index, a sum mostly derived from the roughly 16 percent stake in Amazon that he owns. Public donations by the 54-year-old and his family have included $65 million over the last decade to the Seattle-based Fred Hutchinson Cancer Research Center and $33 million early this year to fund TheDream.us, a scholarship program for children brought to the United States illegally. But Bezos’ giving to date has been on a scale far smaller than the two men just behind him in the wealth rankings, Microsoft co-founder Bill Gates and Berkshire Hathaway’s Warren Buffett. The Bill & Melinda Gates Foundation officially formed in 2000 with a focus on global health and U.S. education reform. It wasn’t Gates’ first foray into giving. He and wife Melinda had previously established the William H. Gates foundation (named for his father), which focused on local as well as global health programs. That fund merged with the Gates Learning Foundation, which expanded internet access to public libraries, to form the organization it is today. Buffett pledged more than $30 billion to the Gates Foundation in 2006. The foundation had given $46 billion in grants through 2017, and is the largest in the world with an endowment of more than $50 billion. The Gateses and Buffett in 2010 created the Giving Pledge, a commitment by the world’s richest people to “publicly dedicate the majority of their wealth to philanthropy.” It has since been signed by 184 people. Bezos, so far, is not among them. Philanthropy on this scale is not without its critics. Rob Reich, co-director of Stanford University’s Center on Philanthropy and Civil Society, said billionaires often receive praise for large gifts, but Americans should view them with skepticism. That has been particularly true in public education. An analysis by the Associated Press earlier this year found that the Gates Foundation gave some $44 million to outside groups shaping state education plans as part of a wider network that has driven the national education conversation. For Reich, the problem is that big donors aren’t accountable to the public like elected officials and are mostly unregulated. They’re able to direct money to whatever cause they see fit even after their death, he said, and may not have to disclose their philanthropic activity. For example, Facebook co-founder Mark Zuckerburg and his wife Priscilla Chan, who pledged in 2015 to spend all but 1 percent of their wealth from the company on charity, nested their philanthropy within a limited-liability company. LLCs aren’t legally required to disclose as much as foundations, Reich said, and they aren’t restricted from giving to political campaigns or investing in for-profit companies. He said there’s almost no way of tracking the full range of philanthropic activity in an LLC unless the company chooses to disclose that information. Money can also be taken out of an LLC, which cannot occur when money is placed into a foundation, Reich said. Those differing disclosure requirements are part of why it’s difficult to rank the most philanthropic individuals. The Bezoses’ $2 billion commitment, had it all been given in 2017, would have placed them alongside Zuckerberg and Chan and behind the Gateses atop the Chronicle of Philanthropy’s list of the most generous Americans. More than a year ago, Bezos posted to Twitter a request for suggestions on philanthropic initiatives designed to make a difference in the short term. That’s a contrast to the long view that Bezos has preached at Amazon and Blue Origin, the space-travel technology company he has been funding with $1 billion a year through the sale of Amazon stock. Another of his side projects is a 10,000-year clock being built under a mountain he owns in Texas. His stepped-up philanthropy comes amid criticism of modern capitalism in historical context, with Amazon often brought up as Exhibit A. The archbishop of Canterbury, leader of the Church of England, Wednesday decried aspects of the gig economy as “simply the reincarnation of an ancient evil” and criticized “companies like Amazon” for taking advantage of a tax system that allows them to pay too little. Amazon, which was briefly the second company valued at more than $1 trillion, has been criticized for years for largely taking a pass on the formal donation programs of many corporate peers. The company’s approach has changed a bit in recent years with the growth of its public-relations and corporate-affairs group, and Amazon has moved to consolidate scattered philanthropy initiatives under way and offer official support for more. But throughout its history, the company has pushed back vigorously on taxes. Earlier this year Amazon played a pivotal role in diminishing and ultimately defeating a Seattle business tax to fund homelessness services and affordable housing. The company paused construction on one building and threatened not to occupy another it had leased, objecting to the prospect of a tax that would have amounted to about $500 per employee at large businesses in Seattle. The Seattle City Council went ahead with a lower tax of $275 per employee, which would have raised $47 million a year – including an estimated $12.5 million from Amazon. Amazon then contributed $25,000 to an initiative campaign that pressured the council to reverse itself and repeal the smaller tax a month later. Amazon has not ignored homelessness, making space in its growing headquarters for Fare Start restaurants that train workers for food-service jobs, and for Mary’s Place, a shelter for homeless women and children. Amazon said in August it expects to spend $40 million on those efforts. The new Bezos contributions appear to be unfolding without much input from even Amazon’s close partners. Mary’s Place executive director Marty Hartman said the announcement Thursday was a surprise, even as Bezos cites the organization’s “no child sleeps outside” mission as inspiration for the Day 1 Families Fund. The magnitude of Bezos’ commitment has the “potential to put a dent in family homelessness,” depending on how it’s used, said Nan Roman, chief executive of the National Alliance for Ending Homelessness. A January 2017 count found nearly 185,000 parents and children in the U.S. without permanent housing, and almost 17,000 living outside. The U.S. Department of Housing and Urban Development spent about $700 million in 2015 on family homelessness through competitive grants, she said. Seattle Times reporters Dahlia Bazzaz, Vernal Coleman, Asia Fields and Rachel Lerman contributed reporting.